It used to be an easy question to answer. Just a couple years ago there really wan’t much competition. When I proudly asserted that Safeco Field had the best craft beer program of any ballpark in the Major Leagues, I said it with a great deal of confidence even though I had not visited every other ballpark. 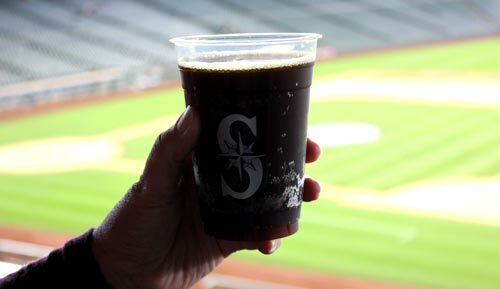 Seriously, in addition to dozens of locally brewed beers available at dozen of locations around the stadium, Safeco Field had things like a rotation of rare, barrel-aged beers on tap, as well as cask-conditioned beer. Hell, one year they even tried selling sour beer at the ballpark. Of course my praise for Safeco Field’s beer program drew gibes from supporters of other teams, but in reality no other ballpark could compare. Even ballparks in other craft beer meccas like San Francisco, Denver and San Diego paled in comparison. What I’m about to say is not a complaint. Seattle’s ballpark still has an amazing craft beer program and you’ll have little trouble finding something good to drink at a Mariners game, but the rest of the league is now catching up. It used to be that at America’s ballparks the Big Beer name-sponsors dominated the beer lineups exclusively, but things have changed and “Best ballpark for craft beer” is no longer such an easy claim to make. It’s a balancing act. Although a ballpark manager is somewhat betrothed to the big beer company that pays millions of dollars per year to be the “official beer of the Seattle Mariners,” the concessionaires also wants to satiate the beery desires of the fans, many of whom want good, local craft beer. At Safeco Field, any backsliding in terms of craft beer availability is attributable to the fact that MillerCoors is pushing the pseudo-craft breweries that it now owns. For instance, at Safeco Field you’ll now find lots of taps dedicated to Hop Valley Brewing, which in many cases have replaced tap handles formerly used to pour real craft beer. Hop Valley is now owned by MillerCoors. So is Saint Archer Brewing, a San Diego area brewery whose beer is rarely seen around Seattle but is now available at the ballpark, poured from taps previously used for local beers. As I said, this is not a complaint. I understand reality. Thankfully you can still get plenty of great local beer at the ballpark. See our previous report. Here are five things I’ve heard about other ballparks improving their beer offerings. I am certain that there are many more examples. As the information below shows, it’s no longer so easy to make the claim that our ballpark has the best beer. A couple years ago at Citi Field, the home stadium of the New York Mets, beer lovers were happy to learn that they could get cans of beer from Mikkeller, the renowned Denmark-based brewery. Recently, Mikkeller opened a 10,000-square-foot brewery with a 60-tap tasting room located just outside the right field gate of Citi Field. It’s not in the ballpark itself, that’s true, but it is Mikkeller. Inside Citi Field they have a number of beers from some renowned, local breweries like Coney Island Brewery, Brooklyn Brewing, Brewery Ommegang and many others. Terrapin Brewing, based in Athens, Georgia, opened a taproom and brew lab at SunTrust Park, the home of the Atlanta Braves. Adjacent to the taproom, the company operates a five-barrel brew system that it uses to make experimental beers — pilot beers. At Braves games, beer fans can taste exclusive beers that may, or may not, find their way into Terrapin’s regular lineup. The Milwaukee Brewers play at Miller Field, but the namesake brewery does not completely control the beer lineup. Lakefront Brewery, Milwaukee Brewing Company, Sprecher Brewery, and Horny Goat Brewing Company are just some of the local breweries represented, but probably the most notable local brewery found at Miller Park is New Glarus. For the unaware, New Glarus Brewing has something of a cult-like following. From what I’ve tasted of the beer, the brewery deserves the hype. The White Sox play at Guaranteed Rate Field. I don’t know anything about the rates, but beer fans are guaranteed to get good beer at the ballpark thanks in large part to a partnership with Revolution Brewing. The local Chicago brewery has now opened a taproom at the ballpark, the #SoxSocial Taproom, where fans are invited to enjoy some great beer and engage in social media play. The taproom even includes a designated spot for ballpark selfies. The Sox also offer beer fans a Craft Kave. Think of it as a bottleshop at the ballpark where they offer 75 mostly local craft beers. In addition to grabbing a can of good beer to take back to your seat, for an additional charge you can sit in the Craft Kave seating area where you’ll enjoy a great view of the game from just beyond the right field wall. At Target Field, where the Minnesota Twins play their home games, you’ll now find a self-serve draft wall. I’ve yet to see how one of these self-serve draft things works, but obviously they do. The draft wall offers 22 local beers on tap, including a limited run of Surly Brewing’s Cut Down IPA, a collaboration beer that was brewed with former Twins player Glen Perkins. Again, for the uninitiated, Surly Brewing is a renowned Minnesota brewery that deserves all of the hype. Beers inside the park at AT&T Park in San Francisco weren’t the most exciting, but there’s a bar/restaurant attached to the stadium that has an entrance into the stadium and allows you to bring 2 beers in per person. Nice taplist of local beers including Russian River. A quick glance at the current taplist and Supplication and Cuvee de Tomme on tap! Yes, Public House! We did just that at AT&T Park last summer. The ticket taker actually told us about it when we entered the stadium and suggested doing it if we liked “good” beer. For $10 each we both ended up with two great local brews (one cask) and the entry/exit system was quick and easy.